Veteran Moose Javian alternative rock/indie four-piece Friend Friend is set to unleash their latest collection of songs on the people of this fine city. 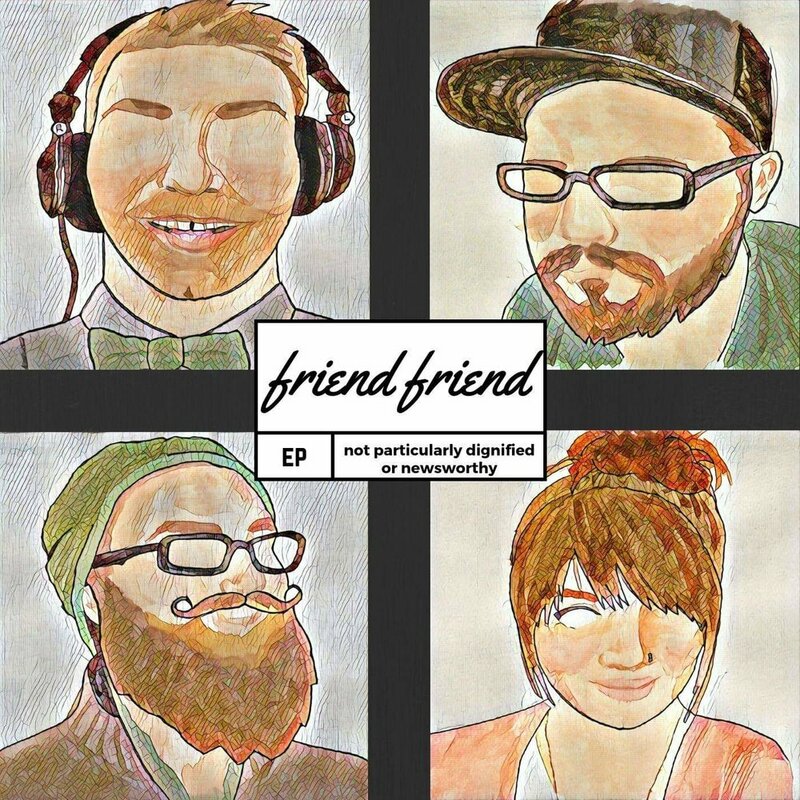 On Saturday February the 23rd Friend Friend is hosting their official album release party at Chrysalis Coffee Roasters at 7:00 pm. The album they are releasing is a five song EP titled Not Particularly Dignified or Newsworthy. It's not just a regular album release party though; its a super, double-fisted, multiple album release party extravaganza the likes most downtown coffee shops don't often see. Also on that evening another Moose Jaw artist, Riviere, will be releasing his album Trees at the same time. Friend Friend's album (which I will be referring to as NPDON from here on out), is the bands first recording since 2015s Post Party Depression. That makes NPDON post-Post Party Depression. Clever how I did that, eh? "Post Party Depression was released in 2015. So it's been awhile" said Friend Friend frontman Dustan Hlady. "I think the albums are pretty different. In this album I think we finally found the sound we were looking for." Hlady'‘s songwriting techniques are bereft of pretense, he is not particularly fond of writing in the "stream of consciousness" style. "I am not one of those song writers that leaves it to the audience to decide what a song means" Hlady said, adding "My songs are deeply personal." The track "We All Stick Together", for instance, was written the night his oldest son was born. There were some complications leading up to the pregnancy and Hlady wasn't technically allowed to stay at the hospital. "I would just pass out in chairs" he said. "The night he was born I dreamt I was singing to him, when I woke up I still remembered the words and the melody. I picked up my guitar in the hospital, because you always take your guitar to the hospital." Dustan's dream became the chorus. He filled in the verses later. At the event the band will be selling zines designed to compliment the album. The zines will contain the lyrics to the songs as well as the stories that brought them to fruition. When pressed about the band's decision to host the release party in a quiet coffee shop as opposed to licensed bar with a stage and a dance floor, Hlady said "we do like to rock but we're a bit of a coffee shop band. We have banter and lyric-centered songs. Plus people should be MORE alert, right?" "The first album did OK on a smattering of college radio stations across Canada" Hlady said. "We played a bunch of gigs, some with artists we really admire, like Jon Bryant. Then we went into recording hibernation for quite awhile. We really wanted this album to be good and I'm proud of what we came up with." As for the new year and what's in store for the band, Hlady says they plan on playing a lot more shows and some festivals. "We'd like to do some shows with local Saskatchewan artists we really like. We'll have some videos as well." Not Particularly Dignified or Newsworthy will be available on all the popular music streaming services.